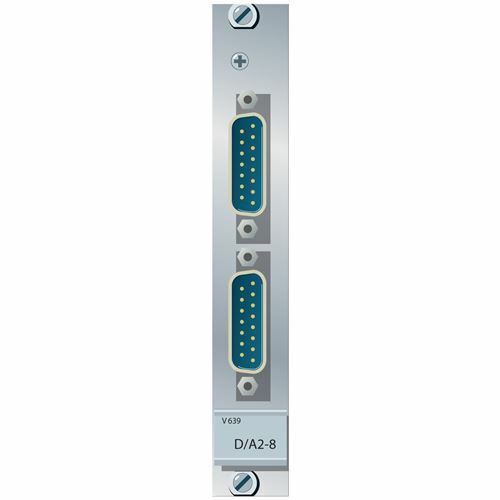 The plug-in card V639 includes an 8-channel delta-sigma D/A converter with electronically balanced outputs for the output of analog audio signals from the VADIS system. The digital signals coming from the VADIS system are processed and output with a word length of up to 24 bit. The full scale output level is adjustable via jumpers to +12 dBu, +15 dBu, +16 dBu, +22 dBu or +24 dBu. Each output has a mute relay, which ensures that no noise can be heard when the system is switched on and off. Sampling frequency 32 kHz min., 48 kHz max.